Both stroller frames and travel system strollers offer parents a way to carry an infant car seat easily outside of the car. Each of these options has its own set of advantages and disadvantages, though. Before you choose one, take a look at how a stroller frame or travel system might work in your lifestyle, so that you have a better idea of which features you may need. What's the Difference Between Stroller Frames and Travel Systems? Let's start with the basics. A stroller frame is just what it sounds like: a frame that you can snap your infant car seat on to form a stroller. 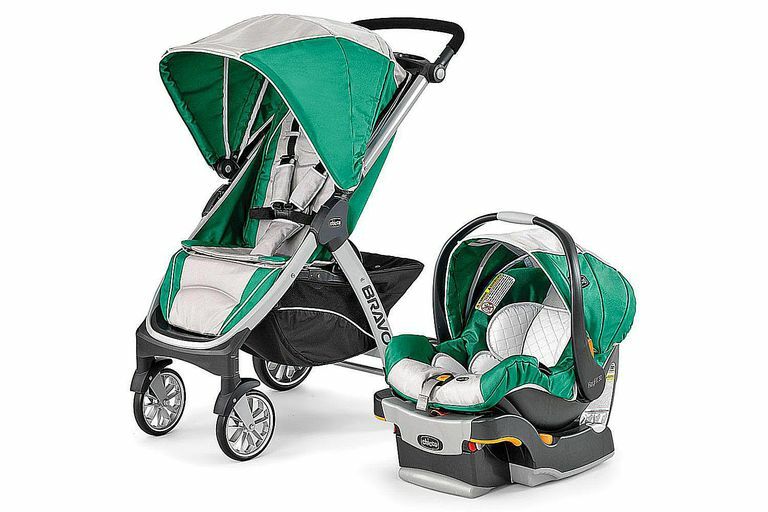 Travel systems are multi-piece sets, sold together as a package, that include a stroller and infant car seat, and may include extra car seat bases and other accessories. Travel systems are widely available in lots of styles, prices, and configurations, so it's pretty easy to find one that you like. The infant car seat, and usually one stay-in-car base, is included with the travel system, so you know the stroller and car seat will work well together. Travel system strollers are usually feature-packed, so you shouldn't lack for cupholders, storage space or other bells and whistles if you choose a travel system. Some travel systems have great convenience features such as one-hand folding, swing out front trays, and fully reclining seats for newborns. Usually, a travel system stroller can be used until a child weighs about 40 lbs., though some travel system strollers are available with weight limits of 55 lbs. or more. Travel system strollers tend to be heavy, thanks to all of those extra features. Strollers that weigh more than 25 lbs. lose a lot of conveniences when they're folded and must be lifted in and out of the car. Heavy strollers are especially inconvenient for parents who live in cities where they must carry the stroller up and down stairs or onto public transportation. Travel system strollers also tend towards the large side in terms of dimensions. Even when folded, some of these strollers don't get a lot smaller, which means your trunk space becomes stroller-only. The size and weight often mean that the steering on a travel system stroller isn't great. Wide turns may be necessary. Sometimes, when companies try to reduce the price of the whole travel system, one component suffers in quality or convenience. If it's the infant car seat that is pared down, it may lose enough features that it isn't worth buying. Infant car seats with harness adjusters on the back, for example, are included with many budget travel systems. The inconvenience of adjusting the harness when it is behind and underneath the baby in the carrier means many parents just don't adjust the harness properly, which isn't safe. In other travel systems, an excellent car seat is paired with a stroller that is flimsy and may fall apart within a year or two. Because of their size and the history of durability issues, travel system strollers are one of the most common "regretted purchases" among new parents. There are some good travel systems out there, but there are also many that don't steer well, are heavy and might fall apart too soon. Stroller frames are usually lighter in weight and more compact than regular strollers. Since they lack the seat mechanism and padding entirely, manufacturers can shave off a few pounds from the total weight and make the whole thing fold a bit smaller. Sometimes the lighter weight may translate into better steering, too, but that also depends on the overall quality of the stroller frame. It can be cheaper to buy a stroller frame and infant car seat separately, depending on brand. Some infant car seat manufacturers make stroller frames to go with their car seats. There are also companies that don't make car seats but make stroller frames that fit a wide range of car seats. Trying out a few different combinations may help you find the best price. Since many parents don't know what, exactly, they want in a stroller before baby arrives, buying a less expensive stroller frame to carry the infant car seat can be an economical way to have all of the convenience of the travel system without spending a lot of money on a heavy stroller that you may not like within a year. Though they're pared down from regular strollers, stroller frames are not without their perks. Most have at least a basket and some cupholders. Some have built-in canopies, one-hand folding, and other cool features. The lack of a seat means the useful life of a stroller frame is limited. Once your baby outgrows the infant car seat, the stroller frame will need to be replaced with a different stroller. If your baby's car seat is one of the newer types with a 30 lb. or higher weight limit, the stroller frame should last for at least a year, and maybe well beyond that. The convenience of the stroller frame is dependent on taking the infant car seat out of the car. Once your baby is over 20 lbs., moving the infant car seat around can get tiresome, and you may prefer to just take the baby out of the car instead of the car seat.